It’s true to say that there is a wide range of event hire companies across the country, both regional and national. So, as an event planner, how do you choose the best event hire company for you? Here’s our 5 top tips for doing exactly that. Product range – It might be that you need to hire furniture for an upcoming event in the form of tables and chairs, or maybe you need to hire a dance floor or mobile bar, for instance. Smaller, regional event hire companies will probably be able to provide you with chair hire, or dance floor hire or mobile bar hire, but probably not all three. This leaves you with a dilemma, therefore, as the chances are that you will now have to pay three different delivery and collection charges. Wouldn’t it be easier if you could source everything you need from one place? That’s where national event hire company Event Hire UK comes in, offering you a range of over 650 products nationwide from which you can choose, therefore you only pay a single delivery and collection charge, saving you money and helping to keep your event budget on track. 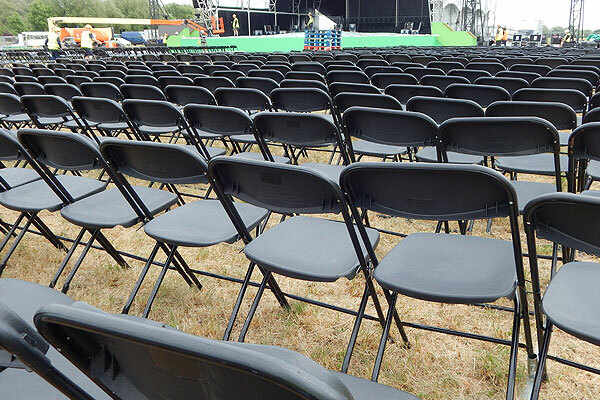 Quantities – Smaller regional event hire companies will be able to offer you a small selection of chairs, for example. However, if you are planning a major event and need Chiavari chairs, for example, in their thousands, not hundreds, then they will have a problem with the quantities. Again, working with a large event hire company such as Event Hire UK means that we have the stocks of chairs and other furniture to cater for most events. As an example, we hold over 10,000 plastic folding chairs in stock ready to service our clients….and that is only one of 650 product lines. Coverage – As an event planner holding events across the country, wouldn’t it be great if you could have a single point of contact at a large event hire company who you can contact at any time to source everything you need? Let’s face it, the last thing you want is to be based in London and you’re holding an event in Manchester, for example and then have to find a chair hire company in Manchester. You’ll be much better off working with an event hire company who offers nationwide coverage. Event Hire UK provides exactly that, with us recently having added our Manchester branch to our already existing Walsall, London and Bradford sales and distribution centres. This nationwide coverage gives us the opportunity to service your event efficiently and effectively. Service – Choose an event hire company that goes the extra mile. After all, as an event planner in the lead up to a busy event, the last thing you need is to be worrying about whether your furniture hire is going to arrive and whether it will be set up correctly. Event Hire UK has a track record of satisfied customers – just look at our testimonials page. By listening to and understanding our clients’ requirements, we provide an exemplary service, working tirelessly behind the scenes to ensure your event is the success you deserve it to be. Expertise – In the hectic world of event planning, it’s often nice to speak to people within the industry who have experience and expertise. Rest assured that the team here at Event Hire UK are able to pass on their knowledge of events and venues, based on a wealth of experience built up over the years. You will now notice that price hasn’t been mentioned in the above. Is price important? Well, of course it is, and for some it is THE most important factor. That said, for many, the additional features above also count for a lot. Here at Event Hire UK, we know that our prices are certainly competitive, but the extra add-ons we offer make us the go-to company for wedding planners, event organisers, marquee companies and corporate hospitality organisers across the country. As with anything else, the old adage “you get what you pay for” applies……and by buying into the complete service package here at Event Hire UK, we’ll work with you to make your event a fantastic success. Why not speak with one of our expert sales team today to discuss your upcoming event requirements.